Best lay flat, stay flat properties. 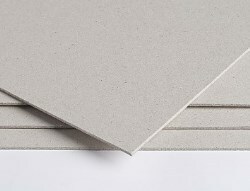 Eskaboard A4 Unlined Greyboard is a graphic greyboard, made of 100% recovered paper, used for books, stationery products and many other applications. This product has been specially cut to A4 size. Please see notes in product details page.